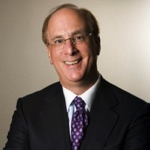 BlackRock-Mellon-Stanley-AIG wasn't meant to be, yet Larry Fink is still on the hunt. But odds are he's not going to buy your alts shop. In a wide-ranging interview, the BlackRock [profile] chief and co-founder tells Bloomberg's Erik Schatzker that the publicly-traded asset management giant is going to be investing M&A dollars specifically in technology. "Where we're going to do acquisitions is in technology, to be adding more to this whole foundation," Fink says to Bloomberg. "I'm spending a great deal of time on that right now. I'm looking at acquisitions." Fink confirms that technology (including BlackRock businesses like risk management platform Aladdin and roboadvisor FutureAdvisor) now generates seven percent of BlackRock's revenue. He predicts that could rise to 30 percent five years from now. As for buying alternatives managers, Fink says, that doesn't appeal to him much thanks to "such 'key man' risk." And he's not interested in paying a premium for such shops either. Not that alts folks don't keep showing up looking for deals. "I don't see us making a large acquisition in the alt space ... It's best to systematically build your own team," Fink tells the publication. "There's not a month that goes by when one of the alt managers or their investment bank doesn't come knocking on the door to ask if we'd be interested." Fink also reveals several deals that he passed up on, including possibilities with AIG, Mellon (which ended up merging with Bank of New York in 2007), and Morgan Stanley (which ended up selling its retail asset management business to Invesco in 2010). "There's a little cartoon in my conference room that's the deals we walked away from, all in a concentrated period of about nine months," Fink says. People were showing us all the different combinations. You can't believe some of the conversations. Most of it maybe lasted a week or two weeks, and then I'd kill it. There was probably not a month that went by that people weren't contacting us. It was a pretty interesting time. The full Bloomberg interview should be well worth the read for many fundsters and other Fink-watchers. He discusses a host of other topics, including: the big deals that Fink did choose to do; BlackRock's 1999 IPO; the evolution of BlackRock's Aladdin risk management platform; where financial services could be heading next; continued consolidation among asset managers worldwide; why Lee Kuan Yew and Phil Jackson inspire Fink; fears about U.S. retirement savings; Fink's own vague retirement plans; the continued global shift from rural areas to cities; Fink's reaction to being labeled "the most powerful man on Wall Street"; Fink's personal role in the rise of the band Maroon 5; the snakes Fink collected as a kid; and of course, active vs passive management and fundamental vs quantitative investing.